A must-own for any home entertainment collection, the Blu-ray Combo Pack (Blu-ray + DVD + Digital Copy) of “Oz The Great and Powerful” brings the epic adventure to life with its vibrantly colorful picture and sound, and boasts a sensational variety of never-before-seen bonus materials including: “The Magic of ‘Oz The Great and Powerful’ Second Screen Feature” that provides viewers with an immersive opportunity to journey into the fantastical lands of Oz; James Franco’s personal story of his journey to the land of Oz that is produced and directed by the Oscar nominated star himself; Golden Globe nominee Mila Kunis’ makeup metamorphosis which is hosted by Academy Award -winning makeup artist Howard Berger; A back-stage journey through each of the visual effects process that brought China Girl to life including an interview with Joey King; and much more. Additionally, all Blu-ray and DVD products include a digital copy of the film allowing consumers to watch “Oz The Great and Powerful” at home, in their car, and/or anywhere they go. I have to say I was really impressed with this movie. It was simply well cast and well written. I honestly didn't know how this movie would turn out or if would do, The Wizard of Oz any justice. It certainly did. From beginning to end this movie was great. Although the beginning went a bit slow, but it picked right up. Both my kids absolutely loved it and my husband was impressed as well. James Franco did an amazing job as the Wonderful Wizard. Filled with not only a great story letting us viewers know just how the great Wizard came to be, it's also filled with lots of humor to keep everyone entertained as well. Let me just say Finley won our entire household over being our favorite character with his witty and hilarious personality. I was also glad to see that Theodora (played by Mila Kunis) the evil witch, was not always bad. How they wrote that was pretty awesome. This is definitely a great movie that needs to be watched and also a perfect way to introduce your kiddos to the amazing movie, The Wizard of Oz in case they haven't seen it yet. 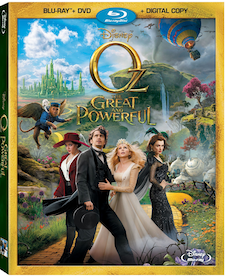 Oz The Great and Powerful is out on blu-ray and DVD today, June 11th, 2013! Be sure to check out these cool activity sheets you and your kids can enjoy as well as enter our giveaway to win your very own copy of the movie! Disclosure: All opinions are my own. 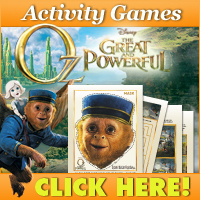 I received Oz The Great and Powerful on blu-ray at no cost for the purpose of this review. No other compensation was received.